Back on Friday Sam Raimi broke the news out of the ongoing San Diego Comic-Con that he’s been developing a television series based on his The Evil Dead franchise. He also explained on the “The Last of Us” panel that he and his brother Ivan, along with Bruce Campbell, are currently writing the “Evil Dead” series. Late last night some mega news hit while I was fast asleep recharging from yet another massive news outing. 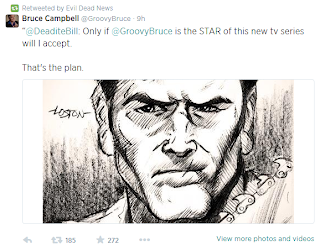 Campbell responded to a fan, via Twitter, confirming that the intentions are for him to star in said series. The Fede Alvarez-directed Evil Dead remake, which hit theaters in April of 2013, bowed well for Columbia Pictures earning close to $100M worldwide. Said remake is rumored to actually be the third sequel – following The Evil Dead, Evil Dead II and Army of Darkness – which would eventually tie into the original trilogy. At the end of the movie, they teased Campbell’s return as Ash (below) – does this mean Campbell will play Ash in the new series? Probably. Will it tie into the movie? Hopefully. Will we see another movie? I’d bet on it.